It’s 5:30 in the morning and I’m sitting in a covered trench in pitch darkness. Beside me, my friend Neil crouches behind his enormous lens, waiting for the first indications of a new day. The odour of rotting flesh wafts through the screen in front of us, not too bad but enough to remind us that the previous day a cow’s carcass was dumped on the ground a few metres away. Time moves slowly and I’m constantly trying to find a more comfortable position. No padded seats here. In fact, no seats at all, and the log I’m sitting on was definitely not ergonomically designed. We speak not a word, however, since silence is all-important. Just after 6:00 now, and the ‘whoosh’ of a very large bird passes directly overhead, followed by some flapping and an evil-sounding hiss. I risk parting the reedy screen a few centimetres and notice that the sky has lightened by a few degrees, revealing the silhouettes of several vultures in the top of a tree. Much closer, several of these giants are already jostling with each other on the ground, just 30 metres away. I’ve never had a problem watching others eat but this is very special. The vultures spent yesterday afternoon investigating how best to gain access to the deceased bovine’s best joints. Clearly that is no longer an issue since the animal has been reduced to a pile of bones and offal. As the sun comes up over this corner of dipterocarp forest on the northern plains of Cambodia, the diners’ identities are revealed. 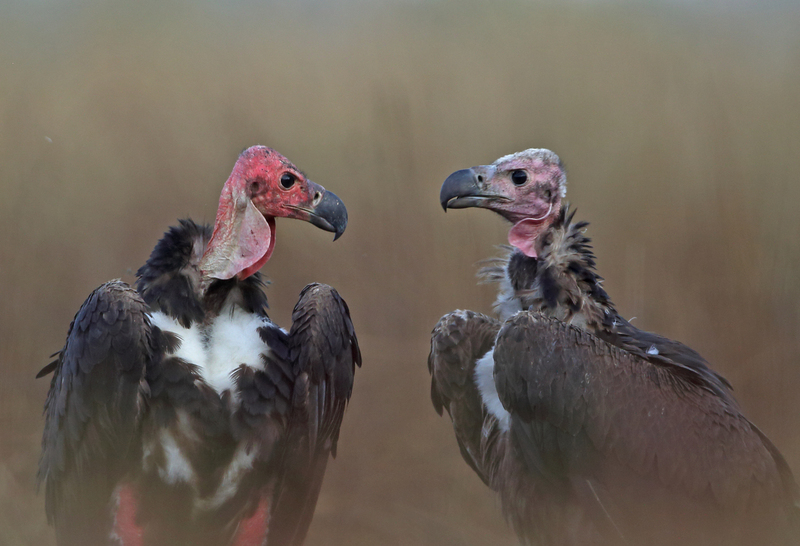 Most are Indian White-backed Vultures but there are also a handful of Red-headed Vultures with their strangely perplexed expressions. The latter seem to spend most of their time standing around, doing very little, but they are clearly one step up in the pecking order. Then there are the Slender-billed Vultures with their black, snake-like necks, perfect for going deep inside any dead animal. It is quickly clear that they always get what they want. The others back away when the Slender-bills hiss out a warning. Screams, hisses and the sound of wings flapping … this is the accompaniment to the end game as bones are stripped of their last morsels of flesh. Apart from their love of carrion, these vultures are sadly united by one thing: their extreme rarity. The 60-odd birds we are watching represent a significant proportion of the world’s population of each species. All are classified as Critically Endangered, and extinction is now a real threat. 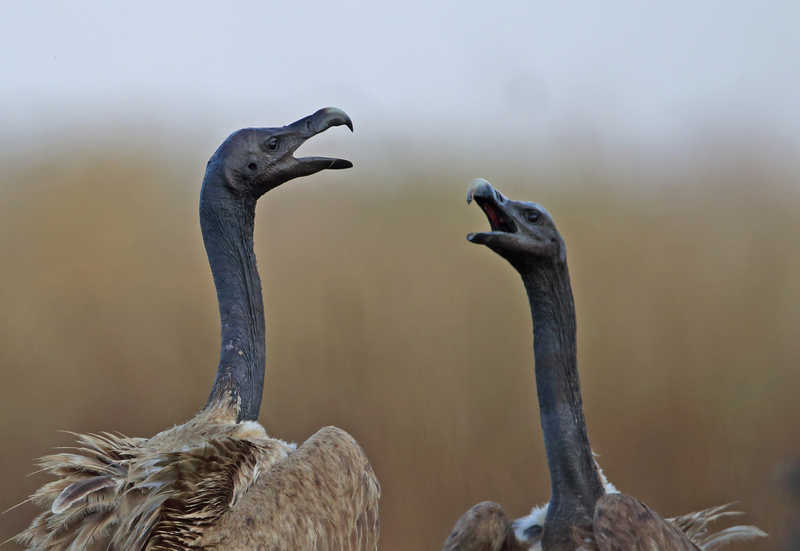 It was not always so but vulture populations have crashed catastrophically since the 1990s, down by as much as 99 percent, due to the treatment of cattle with Diclofenac. Those populations that remain are now disjointed. The drug was never used in Cambodia and only on the northern plains of that country are the vultures holding their own. In fact, here they are just about increasing in number, largely thanks to a series of ‘vulture restaurants’ where geriatric cows are slaughtered on a regular basis to provide a supplementary food source, a strategy driven by the Sam Veasna Center (sponsored by the Wildlife Conservation Society), which works with village communities to encourage them to engage with their local wildlife. Visiting birders and photographers pay for the privilege of witnessing the vultures (and other threatened species such as Giant and White-shouldered Ibis) and the cash goes into the hands of the villagers who provide the carrion. To be fed and guided by local villagers, who also maintain the hides, is an inspirational experience. Families gain extra income; villages are able to fund water pumps, schools and roads; the community is actively involved in conservation. Everyone benefits. This is a magnificent model for sustainable conservation and ecotourism, one that should be adopted elsewhere. Even if you couldn’t stomach the spectacle of vultures poking around in a dead cow’s digestive tract, it is an initiative worth supporting. Tim is the author of RSPB Migration Hotspots. You may like to read more on critically endangered birds in Facing Extinction.